Orbital Cleaning Technology is a superior orbital mechanical cleaning system. This system allows orbital cleaning equipment to outperform other cleaning machines on the market today. Orbital Cleaning Technology is more versatile than standard rotary equipment and can work on a variety of floor surfaces such as carpet, stone, tile & grout, wood, vinyl, concrete, epoxy and many other surfaces. Orbital mechanics allow the machines to vibrate and rotate at the same time. This dual motion action sets Orbital cleaning machines apart from the competition. Orbital Cleaning Technology is starting a revolution in Daily Cleaning. Orbital technology is the preferred choice for routine daily cleaning providing superior results. One of the benefits of using Orbital Floor machines with rectangular head designs is that it allows them to line up flush against walls, edges, and corners, eliminating the need for manual scrubbing of areas that are typically hard to reach with a rotary machine. One of the obvious benefits is that it makes edge and detail work much easier and faster. Floors are cleaner in a single pass – Dual random orbital action quickly and efficiently attacks dirt from multiple directions. Orbital Cleaning machines fixed pad drivers allows the entire pad surface to clean your floor. Dual random orbital action delivers an even clean without swirl marks. 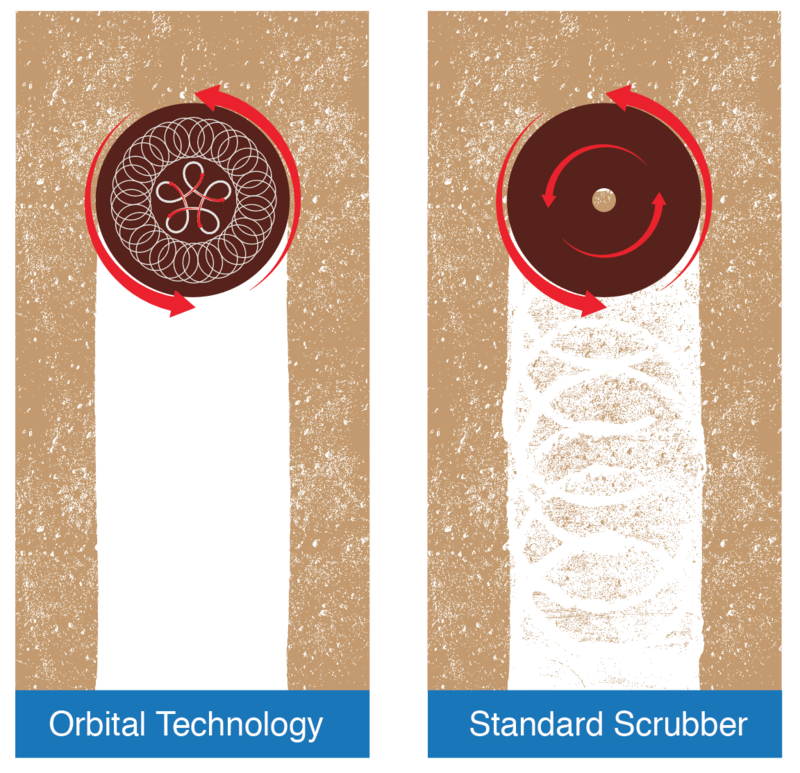 Orbital scrubbing technology with high speed ¼ inch micro scrubbing attacks dirt from multiple directions for superior cleaning effectiveness. Orbital Cleaning machines use far less water than conventional disc scrubbers and saves time with fewer dump and refill cycles. Another benefit of Orbital Cleaning Technology is the ability to remove floor finish with just the use of water and a surface preparation pad. No harsh floor strippers are needed in most cases. Floors with excessive floor finish buildup (more than 3 coats) may still require standard floor stripping procedures to be used. Orbital cleaning machines generally use less water which means less floor cleaning detergent is used resulting in budget dollars saved. The slow macro orbit of Orbital cleaning machines prevents water from splashing onto adjacent surfaces. Cleans tight to walls, which reduces time spent on detail work. Orbital Cleaning machines also have a low operating decibel level which allows for easy daytime cleaning without disturbing facility occupants.